Maarten, Zach, and I spent some time creating a model to look at how Tesla could become profitable in Q3 and beyond. It was based in part on taking Elon and Deepak telling the truth. I just wanted to see what Tesla would need to accomplish to become profitable. I originally created the model based on Tesla’s Consolidated Income Statement, starting with Revenue by segment (Auto, Energy, Services) and then adding in Cost of Goods Sold (Auto, Energy, Service). That is followed by overall Gross Profit, Operating Expenses (R&D and SG&A), and finally, the last part of the model is Net Operations. It was easy to estimate Model S and X revenue based on revenue from previous quarters and expected deliveries. I split out the Auto revenue based on Model S, Model X, and Model 3 as separate line items. Maarten added a section on the split according to different Model 3 options available, the delivery rate, and the number of workable weeks in a quarter. We used this to generate revenue assumptions for the Model 3. Maarten’s model added in other revenue options, such as Delivery, Colour, Wheels, Autopilot, and Full Self-Driving (FSD). Based on Maarten’s work, I modeled the Cost of the Model 3 under the same assumptions as Revenue. I added gross margin assumptions by quarter. 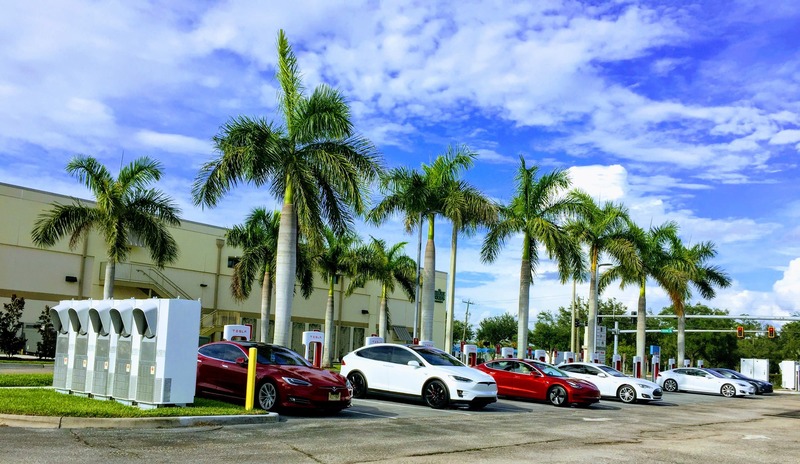 After reading Eric’s work on CleanTechnica regarding Tesla’s cost of capital the Cost section was expanded to include Model S / X Material and Labor, Model S / X Capital, Model 3 Material and Labor, Model 3 Capital, Energy, and Services. The entire model was expanded to Q4 2019. After thinking my numbers might be overly optimistic, I created an Optimistic and Pessimistic version of the model to test the bear/bankruptcy case. The numbers and methods used were back tested against previous financial statements. No question about it, Q2 will be terrible. Below are the numbers from the Optimistic and Pessimistic Model. The numbers exclude the recent layoffs, interest, and taxes. This is a step in the right direction towards profitability. Q1 2018 had a Net Operations loss of -$596 million. If the final numbers are close to the Pessimistic model, Tesla is far away from profitability. The key to both models is the gross margin from Model 3 sales and OpEx growth quarter over quarter. I am using delivery numbers reported from the end of Q2. The Optimistic model has a 2% gross margin and the Pessimistic model has a -2% gross margin for Model 3. 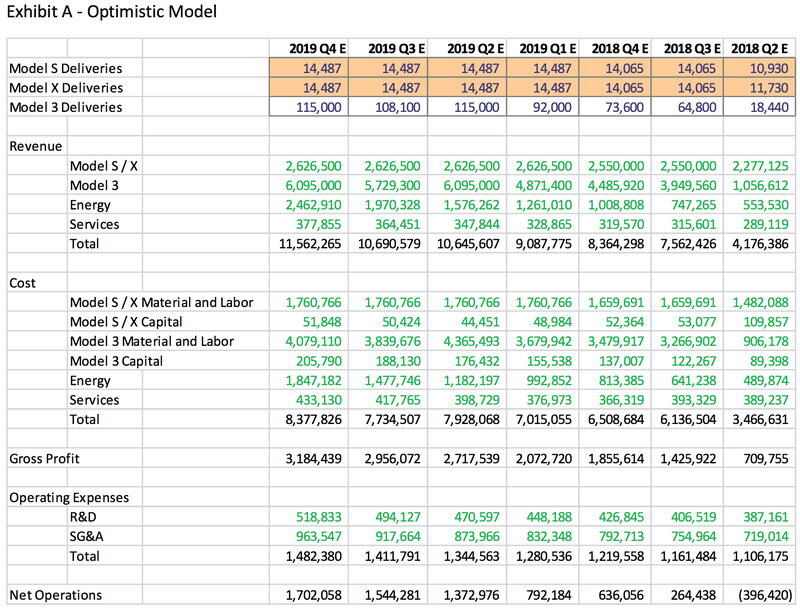 And my Optimistic model has OpEx growing 5% from Q1, while the Pessimistic model has OpEx growing 10% from the same. This is based on the Q1 Shareholder letter than Q2 would be close to break even on Model 3 gross margin. There is a reason why such little time is devoted to Q2 by Elon and Deepak. Future profitability is based on delivering Model 3 in volume and at a sufficient growth margin. For my Optimistic model, I have Tesla delivering 5,400 Model 3’s a week over a 12 week quarter. The gross margin is at 12%, which is in line with comments made by Elon and Deepak that Q3 and Q4 will have much higher gross margin on the Model 3 but still below the ultimate gross margin target of 25%. This results in Tesla having a net profit of $75 million in Q3. The mix of Tesla 3 is estimated at 50% LR, 35% AWD, and 15% Performance. Those who are not keen on Tesla will see this as a dream. My Pessimistic model has Tesla delivering 3,500 Model 3’s a week over an 11 week quarter. Improvements are made to gross margin due to higher volume but the gross margin is at a paltry 7%. The model mix is 64% LR, 32% AWD, and 4% Performance. The results are -$626 million in net losses for Q3. The Optimistic model takes Elon and Deepak at face value that Q3 and Q4 will be profitable. The Pessimistic model assumes profitability is on previous standards of Elon time. One key that doesn’t get enough mention is Tesla Energy. The Optimistic model has Tesla Energy growing 135% quarter over quarter in 2018, and 125% quarter over quarter in 2019. This is based on a 3x increase in MWh for energy storage products. Given the furious growth in Model 3 production, Tesla Energy will be 28% of estimated 2019 Q4 auto related revenues. That compares to just 17% of estimated auto related revenues in 2018 Q2. It certainly will go a long way to making Tesla profitable in Q3 and beyond. The Pessimistic model has Tesla Energy growing 90% quarter over quarter. • If we execute according to our plans, we will at least achieve positive net income excluding non-cash stock based compensation in Q3 and Q4 and we expect to also achieve full GAAP profitability in each of these quarters. 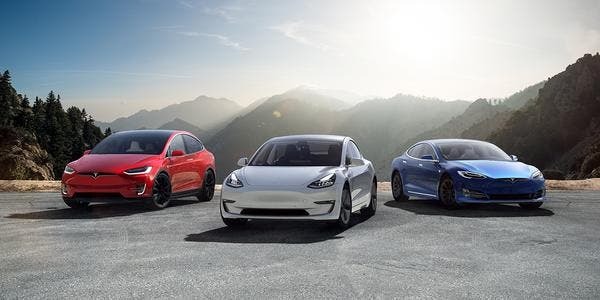 • This is primarily based on our ability to reach Model 3 production volume of 5,000 units per week and to grow Model 3 gross margin from slightly negative in Q1 2018 to close to breakeven in Q2 and then to highly positive in Q3 and Q4. • We continue to aim for a three-fold increase in MWh deployed for our energy storage products this year. 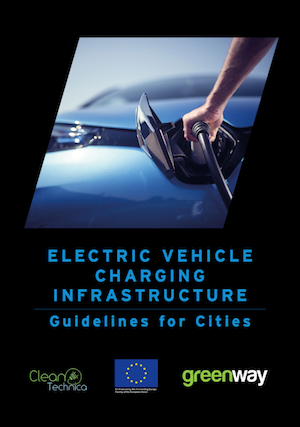 • We expect Service and Other losses to reduce substantially in the coming quarters as our service infrastructure becomes significantly more utilized with the ramp of our Model 3 fleet size. • Consequently, Model S and X deliveries in Q2 will likely be similar to Q1 but should pick up considerably in Q3 to achieve our goal of 100,000 deliveries for the full year. • Quarterly non-GAAP operating expenses should grow sequentially at approximately the same rate as in the past four quarters, with our gross profit expected to grow much faster than our operating expenses. • Interest expenses in Q2 should amount to roughly $160 million and losses attributable to non-controlling interest should remain in line with the last quarter. None of this justifies Tesla’s stock price, lower or higher. That was not the goal of the exercise. The goal was to see under what assumptions Tesla could become profitable in Q3 2018. It is possible, but it does require Tesla to perform at what I call Optimistic levels. The Pessimistic levels are not so kind. Elon is correct that Q3 is “do or die” for Tesla. If Tesla is profitable in Q3, the growth to 10,000 Model 3’s and beyond shows Tesla will be highly profitable and thrive as a company. It also re-affirms Elon’s point that no further capital raise is necessary. Only time will tell which model is closer to the truth. I am long Tesla stock and Tesla call options. And I liked Erik’s disclosure, so I am copying it here. The above is not a recommendation for investment. If you seek investment advice, consult with a professional, and if you do invest, then do it wisely and without allowing the loss of any of your investments to injure you financially. Remember that money invested in the stock, bond, option, futures, and real estate markets can and might go to zero.